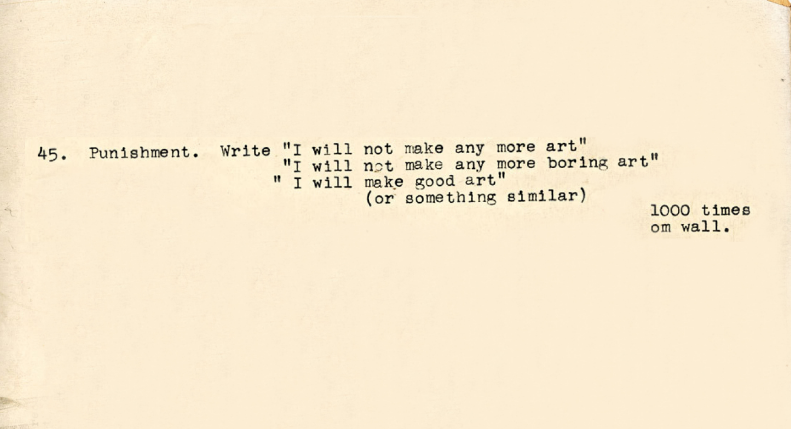 In 1970, when conceptual artist John Baldessari was teaching studio art at the experimental CalArts campus near Valencia, CA, the assignments he handed out to his class were art in themselves. Humorous, confounding, sometimes very specific but often like zen koans, the assignments must have come as a shock, especially to those students with a more traditional sense of what constitutes art. 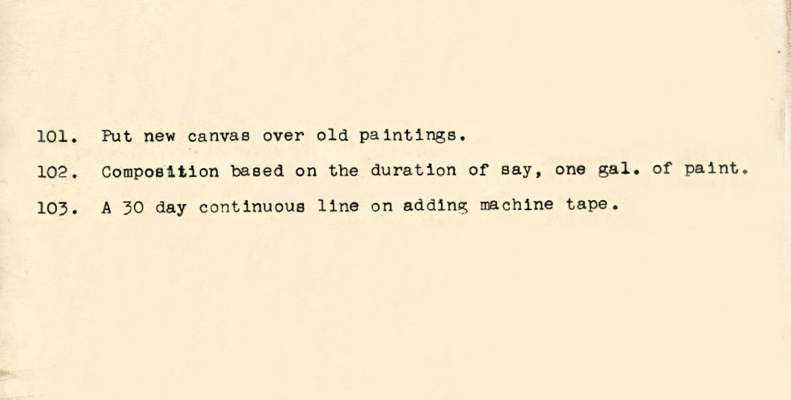 They probably didn’t know that Baldessari was questioning art itself and in the middle of a crisis. That year he had taken all his previous painted work from 1953 - 1966 and cremated it at a San Diego mortuary. He turned from painting to photography. And he expected his students to rethink everything they thought they knew. Looking back at his class assignments, which you can see here, here, and here, it’s like seeing the seeds of ideas that were to be turned into whole careers by the likes of Cindy Sherman, Wayne White, Komar & Melamid, and others. One person copies or makes up random captions. Another person takes photos. Match photos to captions. Defenestrate objects. Photo them in mid-air. Photograph backs of things, underneaths of things, extreme foreshortenings, uncharacteristic views. Or trace them. Repaired or patched art. Recycled. Find something broken and discarded. Perhaps in a thrift store. Mend it. Imitate Baldessari in actions and speech. Some of these assignments are intentionally silly. Some could produce good work. But all are meant to wake the artist up to the possibilities of the form.